Do you have chronic muscle pain, especially abdominal and back pain? What about overwhelming fatigue? Numbness or tingling in your extremities? Stiffness? Insomnia? Headaches? Anxiety? Do these symptoms constantly shift and come and go? As much as all of that might seem unrelated and you may just consider yourself to be always in poor health for some reason or another, it may all be symptomatic of the same one condition: fibromyalgia. This affliction affects about 5 million Americans aged 18 and older, 80-90% of whom are women. And yet, with its wide range of symptoms, inconsistent intensity, and unknown root causes, fibromyalgia remains poorly understood by patients and medical professionals alike. So, what do we know? Let’s go through the symptoms and potential causes, as well as the treatment options for pain management. One of the things that makes fibromyalgia such a difficult condition to live with is how broad the range of symptoms is. 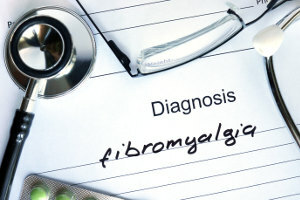 The symptoms that most define fibromyalgia, though, are chronic widespread pain and fatigue. By chronic widespread pain, what is meant is a dull, constant, aching pain that affects both sides of the body, as well as both above and below the waist, continuing for longer than three months. People with fibromyalgia also typically feel a constant fatigue, and report feeling it when they first wake up regardless of how long they’ve slept. Their sleep is also often disrupted by factors including pain, restless leg syndrome, and sleep apnea. As a result, many fibromyalgia patients experience chronic insomnia. These and other factors can additionally contribute to a set of cognitive difficulties known as “fibro fog”. This involves difficulty with being able to remember things, pay attention, stay focused, concentrate on simple mental tasks, etc. These symptoms can come and go, all together or switching out for one another, from month to month. 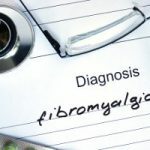 This is why it’s hard for a patient to realize that these symptoms can all be connected, and why medical professionals have trouble making a confident fibromyalgia diagnosis. So, what could be the cause of a condition with such a diverse range of symptoms? The truth is, we don’t really know. Just like with many other forms of chronic pain, there isn’t an identifiable anatomical cause for the symptoms which together characterize fibromyalgia. Researchers believe that the pain associated with fibromyalgia stems from repeated stimulation of the nerves, which leads to a change in how the brain interprets, experiences, and reacts to pain. An abnormal increase in the neurotransmitters that signal pain, increased sensitivity of pain receptors, and decrease in the brain’s pain management through natural painkilling endorphins are all possible factors. Lowered serotonin levels in particular are associated with fibromyalgia. Serotonin is a big factor in pain management. It has the effect of calming and reducing anxiety, and a reduction in its levels leads to a lowered pain threshold similar to that of fibromyalgia patients. Men produce serotonin 50% faster than women, so this may explain why women are so much more likely to suffer from fibromyalgia than men. But how does this happen? Well, some believe that because fibromyalgia appears to run in families, the problem is at least partly genetic. This in itself wouldn’t directly cause the condition, but would make you more sensitive to environmental factors that do. Those environmental factors include infections and traumatic physical injuries that can damage the spinal cord or other parts of nervous system, like severe car accidents. However, some researchers also believe that factors like sleep disorders, stress, and depression may also lead to lowered serotonin levels, and can similarly trigger fibromyalgia. None of this is entirely proven, however, and medical professionals continue to research and speculate. Since fibromyalgia can’t be cured, treatment revolves around minimizing the pain and fatigue that it causes. And since bed rest doesn’t seem to alleviate the fatigue, and the pain is often what keeps sleep from being restful, pain management is the real focus. In this regard, the treatments of fibromyalgia are similar to those for most other chronic pain conditions. The first option which many practitioners push is the use of drugs. There are many kinds that are used to try and treat fibromyalgia, but none that stand out as particularly effective at pain management. Some of these drugs include antidepressants like duloxetine (Cymbalta), as well as the anticonvulsant pregabalin (Lyrica). However, like all drugs, these chemicals have consequences in the form of side effects: nausea, dry mouth, and constipation, insomnia, and dizziness for Cymbalta, and dizziness, sleepiness, swelling, weight gain, and impaired ability to drive for Lyrica. Many other more natural treatment methods provide pain management for fibromyalgia patients and don’t carry the negative side effects that drugs do. Exercise for example is a great pain management option. It increases endorphins which reduce pain and boost mood. However, those suffering from fibromyalgia often feel intensified pain after working out, and avoid it. So exercise is something that has to be slowly worked toward, and there are initial barriers that have to be passed before a fibromyalgia patient can enjoy exercise without pain. To figure out which of these might be right for you, you should consult with a professional who can examine your condition and recommend which treatment options might work best. Back in Shape Chiropractic has been helping patients with pain management in Gurnee, IL for decades, and is licensed to provide quality chiropractic, acupuncture, and other health services. So if you’re suffering from chronic pain and fatigue, give us a call at (847) 249-2225—we’ll do our best to find a solution and get you Back in Shape!